Last Friday at 5:00, Christina woke me with the news that her water had broken, a couple of weeks before her scheduled C-section. So it was off to the hospital for an unscheduled C-section. We arrived at 6:00, and everything seemed under control. There was another woman in the queue ahead of Christina, but that was OK -- there are three ORs in the maternity ward. One is for normal operation, a second for more urgent cases, and a third reserved for true emergencies. We seemed to be under "normal operation," so we were waiting for the other woman to give birth. At one point, we were reassured that Christina would be wheeled into the operating room by 10. Well, 10 became 10:30 and by 11, Christina's contractions were getting worse and worse. What had happened with the other woman? Well, she was having twins, which meant even though she was trying to have them the old-fashioned way, she was in the OR in case of complications. What about the idea that they would run two ORs for more urgent cases (which we now were)? 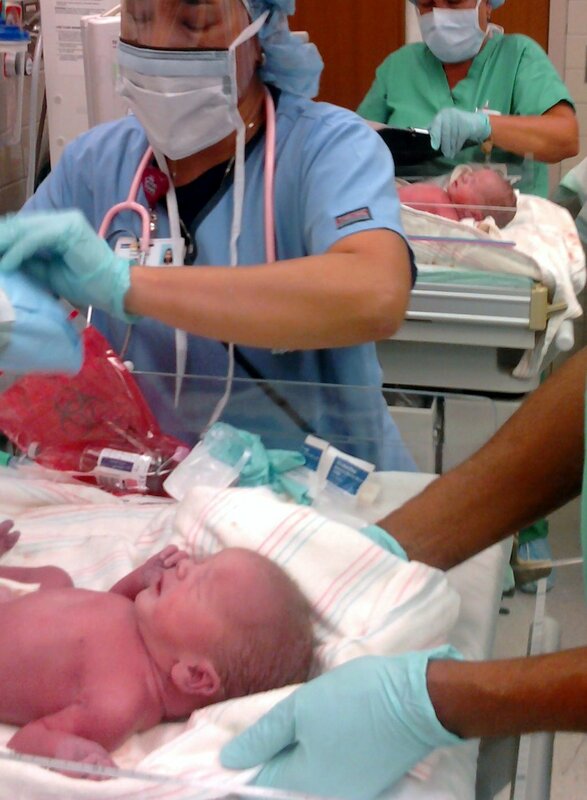 It turns out that the anesthesiology department wasn't comfortable running two ORs when both involved twin births. Since the other twins were taking so long to come out, they weren't willing to move Christina to the OR. So we were being foiled by a different set of twins! After some pleading by Christina (you haven't seen pleading until you've seen a woman in labor plead), a solution was found. Christina was wheeled into the OR, and I was placed in a holding area. I soon discovered the solution -- in another part of the holding area was the other twin mother, who had been yanked out of the one OR in order so that Christina could go into the other. After some movie-quality pacing, I was ushered into the OR. Then came the joyous moment of my sons' birth. But this is twinpanic.com, and everything there went thankfully smoothly, so that's a story for another time. As Christina was being stitched up, however, some nurses rushed into the OR and asked how close we were to being done. Christina's doctor held up her hands to indicate the amount of stitching left. Now the other woman was ready to go, but they needed Christina's surgery to be done first. The moral of the story: if you're going to have twins, plan it for a day when nobody else has the same idea.